Borchert Field: Vintage Brew - "Bunions"
Editor's Note: I am pleased and honored to announce that, starting today, Paul Tenpenny is bringing his column "Vintage Brew" to BorchertField.com. Paul is an outstanding historian of the game and without a doubt the foremost contemporary authority on the American Association Milwaukee Brewers. Paul's column will continue to appear over at MEARS, but he's graciously allowed us to publish this installment here first. I know you'll enjoy his work as much as I do. Welcome, Paul! 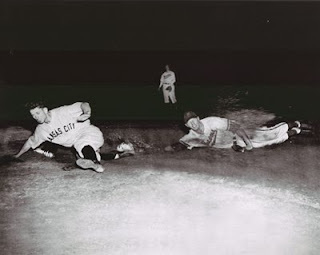 Ignoring Adolph Hitler's call to return home to Berlin, Heinz "Dutch" Becker kept his "not so happy feet" firmly planted on the infield of Borchert Field. A fan favorite in spite of the war and his country of origin, he let his bat do his talking in Milwaukee. Heinz Reinhard Becker was born in Berlin, Germany on August 26, 1915, in the midst of the first World War. His father, a "Brewer"by trade, left his war ravaged homeland with his family to start a new life, raising cattle in Venezuela after the war. In 1925 they moved to Dallas, Texas. The climate must have been good for young Heinz Becker as he grew to Texas sized proportions, 6' 2" and 200 lbs. An athletically talented young man, he was noticed by several scouts and soon found himself in class D baseball by 1938, playing with the Rayne Rice Birds of the Evangeline League (D) and the Oklahoma City Indians of the Texas League (A1). 1939 found Becker with the Palestine Pals and Tyler Trojans of the East Texas League (C) and in 1940 he played with the Longview Texans of the East Texas League (C). Heinz was developing into a very strong .300 plus average hitter and found himself with Dallas Rebels of the Texas league by 1941 (A1). 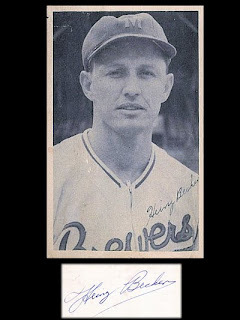 Becker caught the attention of Bill Veeck, the new owner of the Milwaukee Brewers with the American Association (AA) who was in the process of rebuilding his team in Milwaukee and they acquired his contract from Dallas in the fall of 1941. Once Heinz Becker arrived in Milwaukee he quickly became a fan favorite. An outfielder with Dallas, he was moved to 1st base and responded with a .961 fielding average. But it was the switch hitting "Hammering" Heinz that the fans took to their hearts. By 1942 he was one of the most feared hitters in the American Association. He hit with a .340 batting average. 170 hits, including 30 doubles, 12 triples, 6 home runs with 94 RBI‘s. Not a bad debut by any means. Heinz had a short stint with the Cubs after spending spring training with them in 1943 but wasn't quite ready and was sent back to Milwaukee in June. A great deal for Charlie Grimm's Brewers as his hitting onslaught continued unabated from last year. Heinz helped his team to a first place finish in the American Association for 1943 with a .326 batting average in 101 games. He tallied 115 hits, with 22 doubles, 8 triples, 4 home runs and 61 RBI‘s. Not missing a beat for 1944, Heinz again figured prominently in helping Casey Stengel's Brewers to repeat in the top position for the American Association that year. 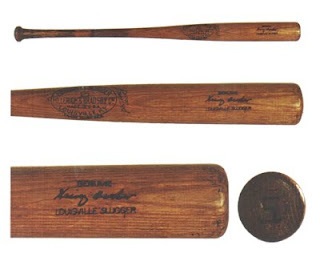 "Batman" Becker hit .346 in 146 games with 526 at bats. He collected 182 hits, with 26 doubles, 9 triples, 10 home runs and a whopping 115 RBI‘s. He played hard in the infield too, having a .987 fielding percentage with 1338 put outs and 112 assists in 1944. 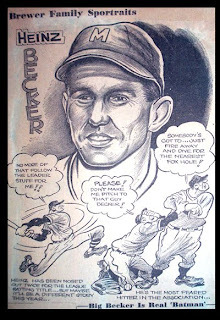 This is Becker's third year in the quest of the league batting title ... Hit .340 in 1942 and Eddie Stanky nosed him out by two points ... Clubbed .326 last summer but was happy that the batting crown went to his buddy Grey Clarke ... this year he appears to be a cinch to hit above .350 and even with Hal Peck setting a steaming pace Heinz is not a bad bet to finish on top. Bill Veeck bought him from Dallas of the Texas league in the fall of '41 and he was sold to the Cubs at the end of the next campaign ... Wasn't quite ready and bounced back ... Again this spring had a trial with the Bruins but couldn't get along with Jimmy Wilson, and says he will quit cold if sent to any one else except Grimm. Because he was born in Germany, Becker received a formal note from Hitler several years ago urging him to return at once ... Presumably to join the wehrmacht ... Heinz, of course, didn't bother to answer ... Winters in Dallas and keeps in trim with a snappy game of soccer ... In the batting clutch give me Becker - THISTED. Charlie Grimm left Milwaukee to manage the Chicago Cubs in 1944. Having managed Heinz, he knew what he could do with the bat and never gave up on him. 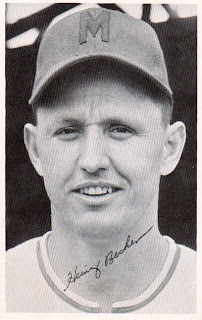 So Becker was given another shot with the Chicago Cubs in 1945. Although his play was limited by health issues, Heinz proved to be quite an asset in a part time role and he helped the team in its quest for the National League pennant that year. He was a key reserve who hit .286 in 67 games with 2 home runs and 27 RBI's. He played great defense making no errors in his 28 appearances at first base, his contributions subbing for the injured Phil Cavaretta kept them on pace in 1945. He pinch hit 3 times in the 1945 World Series going 1 for 2 with a walk and a single off Dizzy Trout in game 4. "Bunions" was the nickname that was hung on poor Heinz, also known as "Bad Feet" Becker as his feet were the absolute worst in the annals of baseball. His flat feet were the cause of his being classified 4F for Military service and the varied afflictions with his feet eventually limited his baseball career. He had broken ankles that never healed properly, He had bunions and corns so bad that he had to be treated almost daily by a foot doctor in Chicago according to his manager Charlie Grimm. 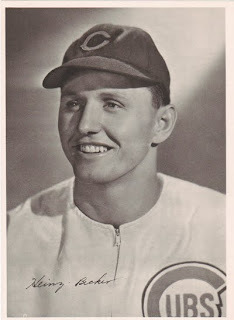 Heinz played briefly in 1946 with the Cubs before being traded to the Cleveland Indians and his old boss Bill Veeck. 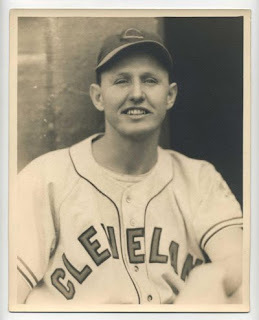 Heinz hit for a .299 batting average in 147 at bats for the Indians with 44 hits. He returned to Milwaukee in 1947. 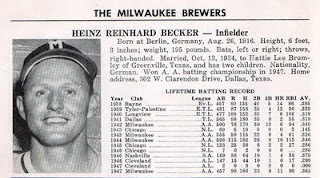 Heinz Becker reestablished his dominance over American Association pitching upon his return to Milwaukee in 1947 and had his best year ever. 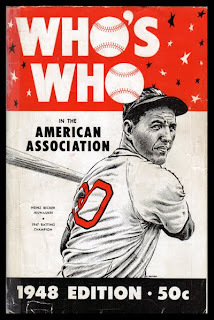 He won for himself what was denied so many times in the past, the American Association Batting title. Appearing in 131 games Heinz hit for a .363 batting average with 166 hits, including 23 doubles, 8 triples, 11 home runs and 90 RBI's. 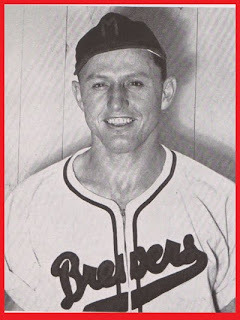 Heinz Becker's final year with Milwaukee was 1948. He had another solid year at the plate hitting for a .321 batting average with 155 hits, 28 doubles, 5 triples and 10 home runs. After Milwaukee, Heinz went on to play with the Seattle Rainiers of the Pacific Coast League (AAA) for 1949. In 1950 he played for the Dallas Eagles in the Texas League (AA) and finished his career with the Corpus Christi Aces of the Gulf Coast League(B)in 1953. German born Heinz Reinhard Becker felt at home in his adopted country. He found love (Hattie, his wife) and happily raised his family in Dallas Texas where he first set down roots in the 1920's. That he was a fan favorite and found acceptance in Milwaukee, Wisconsin during World War II should be no surprise. Milwaukee was built by immigrants and the German people were a large part of the population. He was seen as a kindred soul and a fellow traveler who found a 2nd home here while he played the game of baseball. Being a product of immigration myself many generations removed, (Tenpenny = Zehnpfennig) it is easy to understand why he loved Milwaukee and Milwaukee loved him. It is a fine city with plenty of reminders of home for all immigrants. Even today, its ethnic heritages are celebrated all year long. Heinz, I send you a collective thanks for all of the great memories you gave us, from your fans of Borchert Field past and present. I raise my glass of Vintage Brew to you my friend.